As IT systems change and business needs advance, our mobile platform will enable connectivity of all business critical data and processes. UKB IT enables rapid deployment of mobile applications across multiple device types, including iPhone, BlackBerry, Windows 32 and Windows mobile devices. UKB IT is a front runner in developing applications based on the latest & technologically advanced SUP – Sybase Unwired Platform. We help in creating and managing multiple applications on a mobile enterprise platform to securely connect your data sources to all major device types. Applications developed on SUP are consistent, tested and adaptable to changing business needs. Our expertise on SUP enables your applications a seamless integration with a variety of back-end data sources, including databases, web services, SAP®applications and any enterprise application that leverages SOA. Our proven track on developing Enterprise grade mobile technologies – with device management, data security and mobile database solutions expertise, we can confidently build an enterprise mobile infrastructure on technology already in use at thousands of organizations today. Our expertise on SUP enables development of applications with ease and speed. 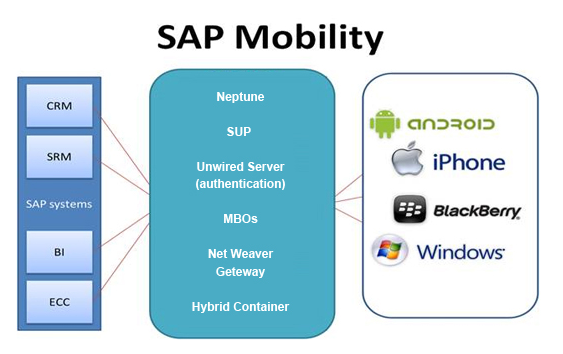 The SAP® SUP development platform integrates with popular development environments, including Visual Studio and Eclipse, and includes 4GL tooling that greatly simplifies native mobile application development.